Water and the Eyrignac Estate are inseparable. Water is present in every nook and cranny of the gardens. Meaning “where the water flows” in Occitan, Eyrignac lives and breathes thanks to it. Seven springs are dispersed around the gardens. It is to their beat that Eyrignac comes alive every day. Springs, ornamental lakes and fountains succeed one another and create different soundscapes that can be detected at the ‘miroir d’eau’ (ornamental lake) or in front of the central pond in the Rose Garden, where four bronze frogs spout water. Equally, water is a source of life for wildlife and many species take advantage to establish their habitat in or near the ponds ; such as koi carp, toads, frogs, salamanders, dragonflies and damselflies. The newly created Spring-fed Garden is deliberatley rural and open and thanks to three springs, the garden’s namesake, it links the vegetable garden to the Rotunda Orchard. 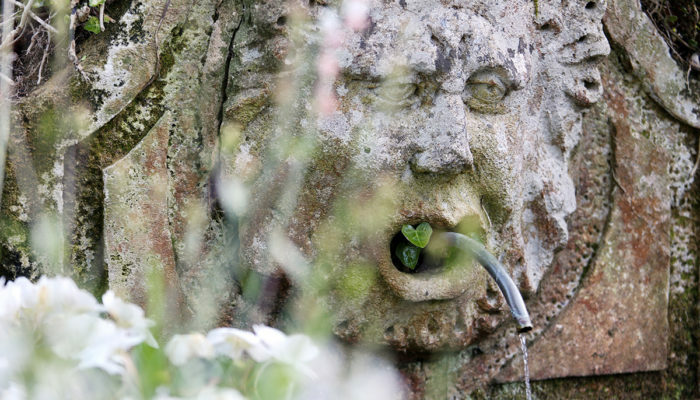 Water is also indispensable to the garden, keeping it green all year round. Thanks to drilling, the precious water allows us to supply our irrigation network and to keep our lawns and flowers in great shape.